Purchased the X-frame in March of this year and received it at work. The pad weighed in on the postal scale at just over 9 ozs. I had to work really late one night and slept on the concrete floor with just a sheet comfortably. It came with a pump to firm the mattress, but I did not need it. Four breaths and it was fully inflated. I just returned from a 9-day pack trip to the Bristol Head area of southern Colorado. The X-frame preformed well on the rocky ground. I tend to be rough on equipment, but the pad showed no visible signs of wear, so I did not try the patch kit that came with the pad. It cleaned up easily with soap and water when our trip was over. I have minimalist tendencies, so I was quite pleased when the pop can sized pad disappeared into the sleeping bag compartment with my 2.2 lb sleeping bag. I am 6'3" and weigh about 200 lbs. 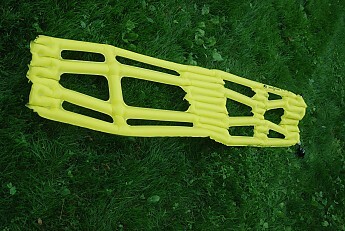 I sleep mainly on my side, and found the x-frame to be quite comfortable. Even when the ground was inclined, I did not slide off the pad like my 3/4 Therm-a-Rest. I had my doubts about the comfort of the cutouts in the pad, but after the 1st night, I didn't think about it anymore. Several in our group will probably purchase one before our next outing, they were impressed with the speed to inflate or deflate the pad, the lite weight, and the little space the pad consumed. I have been a hiker for a little over 40 years now and really appreciate a little more comfort between me and the ground. The temps only got down to 30 one night, so I could not make a judgement about the cutouts adding to any extra thermo abilities. The price was more than I wanted to pay for a sleeping pad, but the benefits of space and weight eased the pain considerably. I really like this pad. Guyz, any chance you could add a few photos of the pad with a tape next to them? I am really curious about the dimensions of this pad. IF this pad fits YOUR body, it offers impressive comfort per ounce of weight. Surprisingly adjustable with its high psi capacity, the sparse structure rewards both the back and side sleeper with a good night's rest. The Loft-Pocket design works best your bag has high-loft insulation such as down or PrimaLoft. It is an unbeatable U.L. combination in cold weather when paired with a thin, closed-cell foam mattress. I was intrigued by this pad, especially considering its radical departure from traditional pad design. I have ultra light closed cell foam pads for keeping pack weight down, but my sleep suffers when I use them, and they're bulky. I was in the market for a light but comfortable addition to my sleeping options. As a happy Therm-a-Rest owner (Basecamp Reg. for years) my first inclination was towards their offerings. I came across this pad on Trailspace, and decided to research further. After research and a chance sale, I made the purchase but was prepared to return it if needed — still skeptical. The logic behind the design was sound, but the execution of the concept? I am pleased to say yes after putting this through its paces in all but the dead of winter in the last 10 months. This best fits a person in the height range of 5'9" to 6'1". I had my son (5'3") try it and his head was in one of the loft pockets. I'm just beyond this range at 6'2", but it still works well for me. They should make a women's version of this pad, for 5' to 5'5". I would probably benefit well from the XL version. That being said, the standard pad is supremely comfortable for me on my back. I have slept on my side as well, and once I finally found the right way to position myself, enjoyed several nights of restful sleep. The skeletal design only allowed me a couple of optional side-sleeping postures. Not a problem for me, but might be for someone else. Here is the key to side-sleeping on this pad if you decide to sleep with it inside your bag: set your bag up on its side to begin with, zipper up, with the pad on the side of the bag. Crawl in, zip up, and side-sleep to your heart's content. Staying on this pad when it is outside of the bag was less difficult than I had though it would be. One could easily secure it to the outside of a bag with the right kind of strapping. 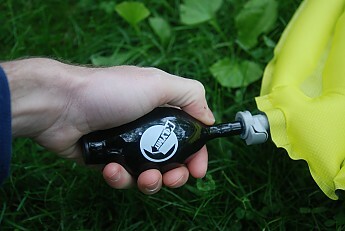 The X Frame pad is laughably easy to inflate. It takes me 3 breaths to inflate at the most. The pump really gives me the ability to firm this up, great for keeping me off the ground and debri. However, the more you pressurize the pad, the more it shrinks in width. When firm, this pad shrinks to about 17-18" in width. Length shortens only a 1/2" of so. I measured the pad at 9.2 oz, slightly heavier than the claimed 9.1. Total packed weight with patch kit, pad, pump,and stuff sack is 11.2 ounces. This pad will disappear in your pack. It is so small. I can fit the pad, pump, and patch kit in a sandwich sized ziplock. I will say that deflating the pad entirely requires some learning, but most won't feel compelled to completely deflate it because it's so compact to begin with. If you must (and I must), you first open the valve and smooth the air out, then pick it up and wring it out from top to bottom, pulling it through a tight hole made between your thumb and index finger. That usually takes care of it. I ruined the stuff sack (see the holes?) through my own errors in judgement, but it is plenty big for this kit, which is sooooo small. 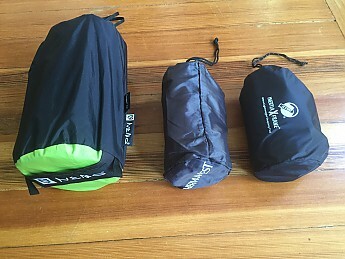 The loft pockets work well for my down and Primaloft bags, where the lofty insulation is housed in a thin but strong, flexible fabric shell facilitating loft and expansion. 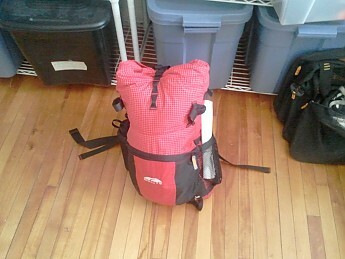 My extra bag, filled with Thermolite (HollowFill 2) and a heavier denier shell didn't fill the "loft pockets" as well. I think the pad works better inside a bag, where gravity can assist in lofting the pockets, if you will. I slept on it this Summer while beach camping (though the ground below was rough) and it outperformed my Basecamp 2" in terms of comfort. I used a fitted pad sheet over a rectangular 20X72 ensolite pad to sandwich the X Frame and hold it in place, then used a UL blanket — a great summertime setup. I did try this another time outside my tent on a thin groundsheet, with protruding rocks and small pinecones, and did occasionally feel them in the loft pockets when I moved around — not recommended. This pad will not perform well in those conditions. It also is not intended as a seat in the backcountry for the same reason. I also tested this pad in just shorts, fully inflated plus one air pump shot. I slept on the tile in my kitchen with only a sheet covering me, figuring that the cold, hard floor would expose any design flaws in the skeletal design. I slept on my back to start, but without a mummy bag to hold my arms in place on my chest, my arms ended up on the cold floor. I turned on my side and didn't experience cold spots from ground contact again. I did welcome the coolness in the voids since it was warm that night in my house. 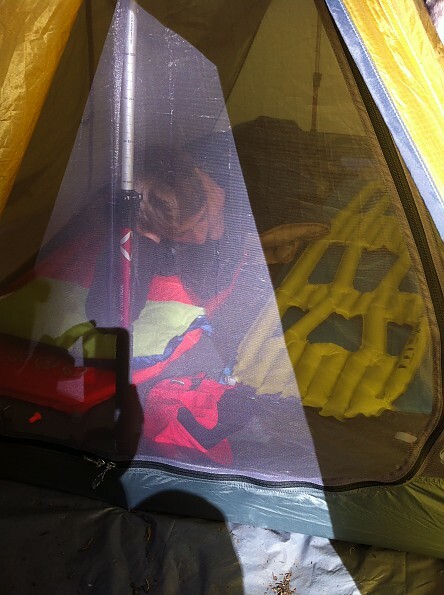 I did not experience cold spots when used with a sleeping bag on any real camping trips. However, if I had loose skin, excess fat, or a big torso, I might have touched the ground in the pockets. But I was comforatble thhe rest of the night. This pad is very well constructed. The welded seams are impeccably executed — the best welding work I've seen. The fabric is extremely durable, having stood up to nights out on the rough ground of the San Gorgonio mountains without a puncture or scratch. I was concerned at first, but with the excellent repair kit, I got over that quickly. I did not have to use the kit. I applaud Klymit for thinking outside of the rectangle and challenging conventional thought. This pad is as light as it gets, and stands unchallenged in the comfort to insulation to weight ratio — IF it fits your body type. Make sure it works for your build and you won't be disappointed. I use mine inside the sleeping bag. Never going back to the other pad. 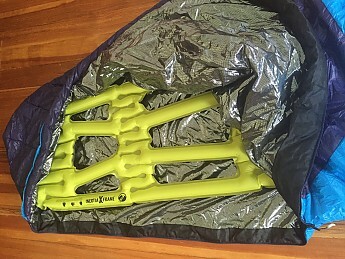 The Klymit Inertia X Frame pad is an exceptionally lightweight pad designed for long distance hikers, bike tourists, or other backcountry adventurers who want light equipment, but are seeking a level of comfort different (thought not necessarily greater) than a closed cell foam pad provides. It's incredibly compact, easy to inflate (though not to deflate), and reasonably comfortable, though might not be as comfortable for the very short or very tall. 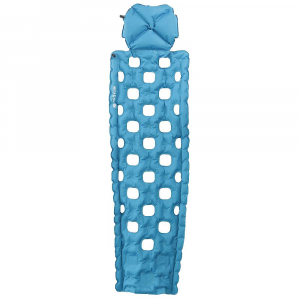 This pad is best for light hikers, bikers, and runners who want to minimize weight and volume. “Voids” make sizing important. Shorter folks beware! Leaking is possible with bulb attached. Difficult to maintain high pressure. 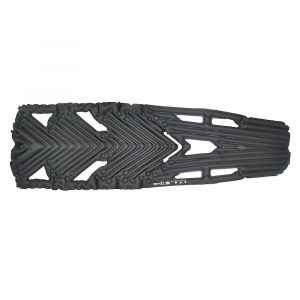 The Klymit Inertia X Frame sleeping pad deflated. This pad is a snap to inflate. At sea level in both cool (36°F) and hot (80°F) temperatures, 4-5 robust breaths of air into the inflation/deflation valve inflate this pad. At this point, instructions dictate using the detachable bulb to “top” it off until it's quite firm. This requires 5-20 puffs of the bulb. Out of curiosity, I attempted to inflate the pad with the bulb alone. Not recommended: 275 squeezes later I lost count. Also, make sure to detach the bulb after topping the pad off. Leaving it on created a slow-leak situation for me one night, and I woke up with the pad nearly flat. When pumped up to high pressure, the pad did seem to lose a bit of air overnight. 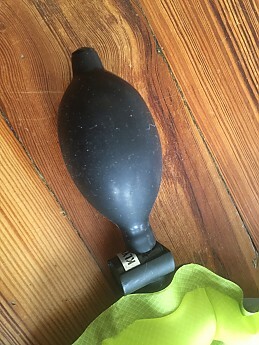 Certainly not enough to make it “soft,” but enough air seemed to diffuse through the material so that it required another 3-5 pumps from the bulb in order to firm up again. Popping the mouth valve open releases a torrent of air that deflates the pad about 80 percent. Here, things get a bit tricky. I tried my standard deflating technique (folding in quarters and sitting on it), but this didn't work well. Instead, Klymit recommends that you fold it in half lengthwise and roll it towards the bottom. 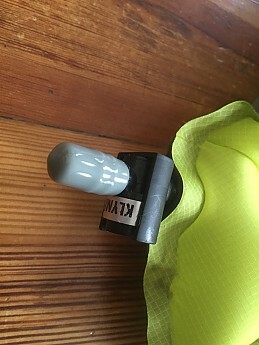 The mouth valve requires a substantial degree of pressure to release the air, and it took a bit of trial and error to get the pad to deflate fully. I tested this pad at 36°F, in the mid 40s, and at 65°F, all with the same EMS Velocity 35 men's sleeping bag in a Henry Shires Tarptent Cloudburst 2*. On the 36-degree night, I wore a full set of EMS Bergelene Base Layers, a thin synthetic cap, thin synthetic gloves, thin liner socks and wrapped my The North Face DIAD Jacket around my feet. I slept well that night, but did notice some cold spots that seemed to coincide with the voids in the pad. Kylmit claims these voids provide the opportunity for the sleeping bag's insulation to loft underneath you, but I theorize that this doesn't occur with sleeping bags that don't have a lot of loft to begin with, like mine! I did sleep through the night, and didn't shiver, but certainly noticed these colder areas. During the nights in the 40s, this pad preformed admirably with the same setup, minus the hat, gloves, and jacket-around-the-feet. At 65-70 degrees, the cool spots were nearly a blessing! 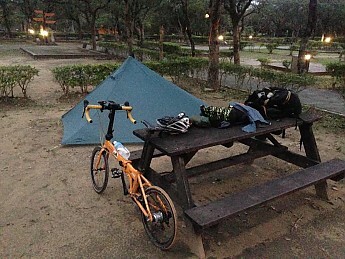 Having ridden my bike hard for more than 20 miles to get to my favorite local camping spot, I was clammy and a bit warm when I went to bed. The Velocity 35 only has a quarter length zipper, but I was still cool enough to get in. The ventilation provided by these voids meant that I woke up drier and less sweaty than when I retired. With my ordinary closed cell pad and the singe-wall tent, I ordinarily would have awoken quite clammy. This pad isn't less comfortable than a closed cell pad, its nearest cousin in weight, but it isn't more comfortable either. It is “differently comfortable.” The pad is 73 inches long. At 5'7", I'm 67 inches long. This small difference in size led to some minor discomfort during the night, as I shifted about and different parts of my body aligned with the inflated portions (felt great) and the voids (not so great). When my body was aligned with the inflated portions, this pad was quite comfortable. When I was not aligned, this system was less comfortable. If your height differs from this pad's length by more than six or so inches, this problem might affect you. It occurred to me that this problem might be remedied by placing the pad inside my sleeping bag, and when I'm able to purchase a bag that will fit this pad, I'll report back. It's worth noting that this pad did not skid around the slick nylon floor of my tent, a very welcome result. My pack, ready for my last test of this pad: bike camping! This pad is supremely packable! Deflated and wrapped up in the storage sack, it is barely 8 inches long and 11 inches in circumference. Unpacking was an eerie experience, as it appeared that I had forgotten my sleeping pad until it emerged, so small as to be nearly invisible inside my pack! Stuff sack, pad, bulb, and repair kit weigh 11.1 ounces together. The pad and the bulb alone, the minimum useful configuration, weights 10.5 ounces and the pad along weighs 9.2 ounces. 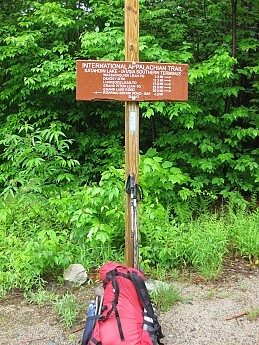 I tested this bag camped north of Baxter State Park in late May, in temperatures down to approximately 36°F, in Mid-June in the same area, while backpacking a segment the International Appalachian Trail, and in early July in southern Maine, during a sub-24-hour-adventure bike camping trip. * The author is employed by an organization that is the recipient of donations by Tarptent, and that provided this Tarptent to the author as a gift four years ago. 275 pumps later... Woah. You have more patience than I do by a long shot. So, I take it that this would not be the pad for winter treks due to the voids in the design. I wonder how effective a closed cell(blue) pad would be under the Inertia for cold weather travel. Nice review Seth. We're on the same page here. I think putting this over a closed cell foam pad would be a powerful combo. I can't wait to try it. Hi fellas. This could be a great pad for Winter treks IF you're sleeping bag is high loft (to fill the voids) and you use Klymit's ARGON insulation. One cartridge and valve would add a mere 3 oz to your packweight and would last you for at least one trip. If you forgoe the NOBLE-TEK Argon insulation and use this with another UL pad (including an Ensolite pad) you would have a real strong Winter performer. Great point Xterra! I'm considering a follow-up review for this winter. 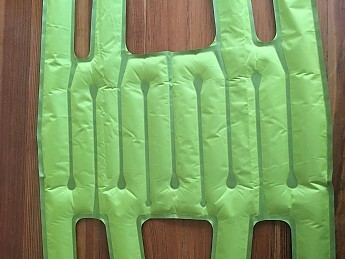 This uniquely designed air mattress fits inside your bag and has cutouts to utilize the bag's loft for insulation. While the latticework design grants light weight and compact storage, it does make re-packing difficult. 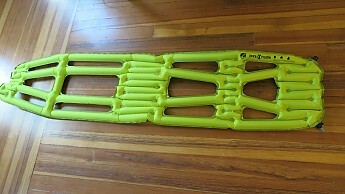 I have been intrigued by the Klymit X Frame since I first saw it at REI. The latticework design gives it an extremely small footprint in your pack—the reclaimed space alone makes it easy to justify the upgrade. The one downside that originally kept me from purchasing an X Frame was the fact that I couldn't find an R value. Living in New England, insulation may be the most important part of a backpacking mattress pad. SIZE / WEIGHT: At 10.4oz (9.7 if you don't carry the optional squeeze-bulb used to fine tune firmness), the X Frame is extremely small and lightweight relative to other mattress pads on the market. My X Frame is full length and rivals my short NeoAir for both size and weight. 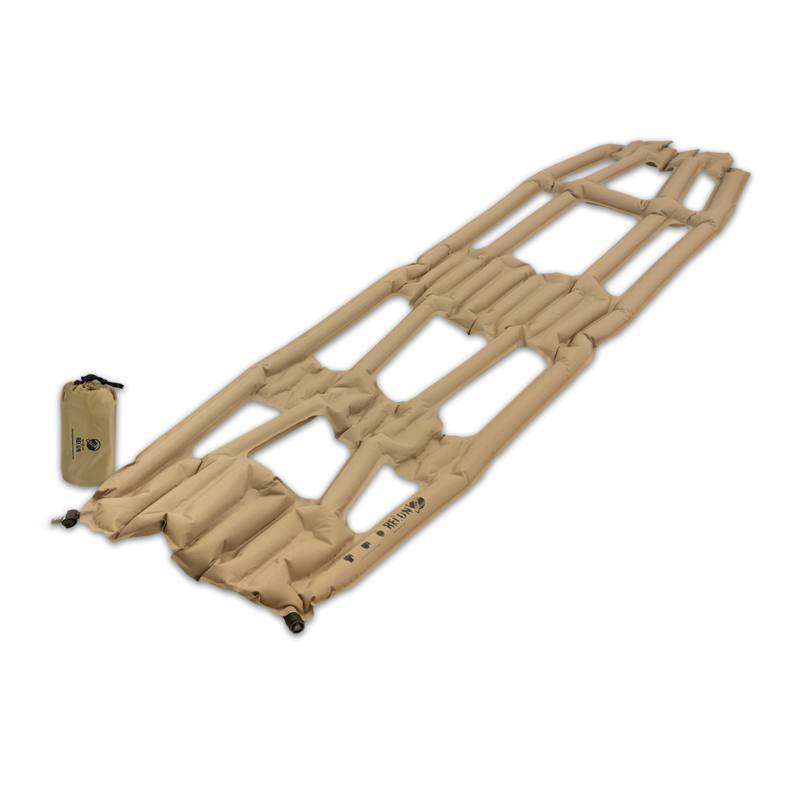 Klymit is able to achieve this small size by cutting segments out of the middle of the mattress pad to create a latticework frame. DESIGN: The X Frame uses a latticework design to save weight and space while maximizing warmth. While this is a clever idea, it's a bit of a double edged sword in my eyes. Unlike most pads, the X Frame is intended to sit inside of your sleeping bag, meaning you won't have to worry about sliding off your pad in the middle of the night. The "Loft Pockets" (holes in the latticework frame) then allow your bag to loft underneath you, providing insulation against the cold ground. Another nice benefit of the latticework design is that it inflates much faster than similarly sized pads from other manufacturers. The X Frame includes a regular blow valve as well as a fine-tuning valve that can be used with an optional squeeze bulb (included). While the design of the X Frame was carefully planned to fit the human figure, it only really works if you are roughly the same height as your mat and if you lay on your back. As soon as I rolled onto my side or my stomach, I noticed that my legs pushed through the "Loft Pockets" and came into contact with the cold ground, completely nullifying the benefit of such a design. If you happen to be significantly shorter than your pad, you would likely have similar issues in any position as your joints wouldn't line up with the design of the pad. WARMTH: Since the X Frame doesn't rely on its own insulating capabilities to protect you from the warm ground, but rather on the loft and insulation of your sleeping bag, Klymit doesn't provide an R Value for this pad. That being said, the "Loft Pockets" in this pad do a good job of keeping you off the ground and allowing your bag to insulate you. After a recent 30°F night, I was impressed at how warm I stayed throughout the night. This was, however, only effective if I lay on my back. As soon as I rotated onto my side or my stomach, I found that my arms / legs / hips fell through the "Loft Pockets" and I quickly lost all benefit. 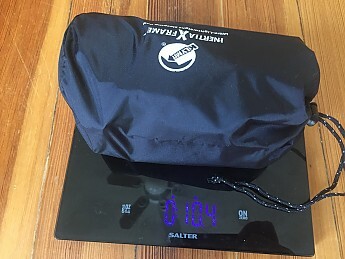 For my test, I used a bag that has relatively little loft, so it's likely that you will get even better warmth if you use a natural down bag with high loft. However, the simple fact that this pad relies on the loft and insulation provided by the bottom of your bag means it will only work if you have an actual bag. Those using quilts won't get much benefit here unless they have another layer between the ground and their pad. PACKABILITY: This is the real drawback of the Latticework design. Because of the complexity of the latticework, it is nearly impossible to get all of the air out of this mattress when you go to pack it back up. Even re-packing at home can be challenging. Unlike other mattress pads, you can't just roll this one up and force all the air out. You have to go through each tube and carefully push the air out before you begin rolling at all. Even if you take your time, you'll probably find yourself unrolling and re-rolling this pad a few times before you're ready to pack it away. Once do you manage to get all the air out, the X Frame is remarkably compact. A full-length X Frame takes up about the same amount of space as my half-size NeoAir pad. 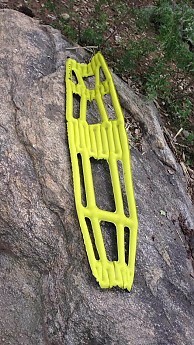 Above you'll see my Nemo Cosmo Air, Therm-a-Rest NeoAir (short / half length), and Klymit X Frame. Including the stuff sac, this pad weighs in at 10.4oz, so you aren't likely to care about the weight of carrying it. If you really want to save weight, you can drop the optional 0.7oz squeeze bulb (used to fine-tune the firmness of the pad once inflated). 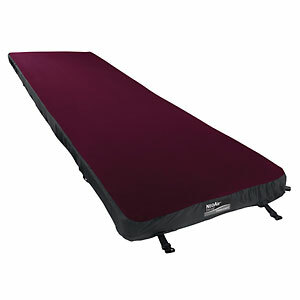 THOUGHTS: If you have a nice warm bag with good loft and want an ultralight mattress pad that won't shift around too much in the night, the X Frame would be a good option. Be prepared to spend a lot of time and effort re-packing this one, though. However, if you want a pad that will work with a bag, quilt, or on its own, (or if you don't want to spend all day trying to get air out of your pad) you should probably look elsewhere. Good to know. As a side sleeper, this wouldn't work for me. Thanks for the very helpful review, Brent. [2015 New Year to Taiwan island, because of the volume and weight of equipment required so with the cushion. Overall, pretty good, lightweight, small size is an advantage of compression. But three days after camping a leak. One night could not sleep. This product is lightweight, and is a good choice for the right person. This is really a very good product. But it really is a niche product. 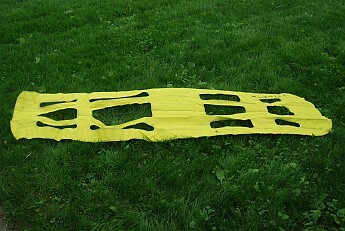 This pad is about 6' long, and because of its size and design, the padding is located at the "sweet spots" of head, shoulders, hips, and feet. Well, as an average sized woman, this was not a good choice. While that is not the product's fault, the pad is not really good for all hikers. I love the very lightweight part, and that it is tough. But I was very frustrated that I have to sleep within only the sweetspots' locations, and I "bottomed out" while sleeping on my side, especially at the shoulder. I love that the pad blows up very quickly. But I found that once it was blown up, I could not "fine tune" the fit. I will not be using this pad next season. But if Klymit ever makes a similar pad that is thicker and designed for a shorter person's height, I would take a long, hard, serious look. But for now, I need to find an average sized man who could use this pad. This pad is designed to go INSIDE the sleeping bag! This pad is designed to go INSIDE the sleeping bag! I never roll off this pad!! At 9.1 ounces, this pad disappears into my sleeping bag stuff sack until called upon to insulate my chilled core. The pad is built with gaps where the body does not contact the ground, these gaps allow the insulation in ones sleeping bag to sustain full loft, keeping the body warmer! The last thing I want to do after mile 10 is to huff and puff into my sleeping pad. I mean, I am huffing and puffing anyway, but mostly just to remain conscious. 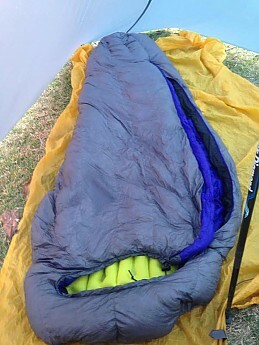 I have several sleeping bags that, when used at high elevations, after an exhausting day, and with chapped lips, the mouth-to-valve connection is beyond my abilities. Not so with the Inertia X Frame. This 9.1 ounce beauty inflates with just three breaths, really, three! What is better is that those breaths can be fairly relaxed, as they need only supply the bulk of the air. 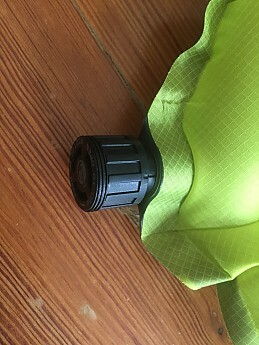 Once the valve is tightened the user simply turns to the other top corner of the pad, inserts the ball pump, gives twenty or so squeezes, and the pad is perfectly firm for those extra cool evenings or extra hard shelter platforms. Even better, after that midnight tinkle, once you return to your cozy sleep system and find that the air has condensed during the night, just click the ball pump in place again, squeeze, squeeze, squeeze, and ta da, the pad is once again firm without removing it from the bag, leaning over to huff and puff, or disturbing your tent mate with other pad adjustments. The pad has lasted me through years of trips in and around the high desert of Arizona. It continues to serve me well here, in New Hampshire. As the pad spends all of its time in my sleeping bag, during use and while in storage, it is never subject to puncture or abrasion. This is a comfortable, light, and packable pad. I'm 6'4" and it worked fine, back and side sleeping, just not under my head. Durability may be an issue, maybe depending on how clean you are. I really like this pad as a pad. I used it inside my bag, and it worked great. 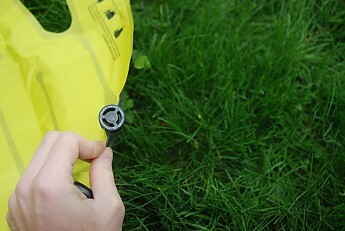 Easy to inflate and deflate (after opening the valve while lying on it, I folded the pad the long way and rolled it up). I bought it new before a thru hike of the Colorado Trail in 2014. I used it inside the bag. After a few weeks of my 200 pound, sweat and sunscreen marinaded body laying directly on it (eeww! ), the pad began to delaminate. I could see the edges of the air tubes getting closer to the outside. Eventually, there started to be a slow leak. I couldn't hear anything, but midway through the night I would notice it had gone flat, and repump it. After the trip, I sent it back, in the condition it was in, and asked if it was under warranty. They sent me a slightly different model as a replacement, with a note saying that it shouldn't have leaked if I had used it properly and kept it clean. Well, I did use it properly, in the bag, and I really don't know how I could have kept it clean on a trip like that. It probably would have been much cleaner if I had used it under the bag, but then it wouldn't have been nearly as comfortable. Perhaps Klymit has improved the product, but if you use it the way I did, you should be prepared for the possibility that it will have a limited lifetime. Lightweight, easy to setup and use. I used to not worry about a sleeping pad when I was younger but as i've aged, I needed some help for sleeping on the harder grounds. If you are looking for a lightweight sleeping pad, this is the way to go. If you don't mind carrying more weight, there are probably more comfortable options out there. Purchased this product about 2 years ago and have used it many times. 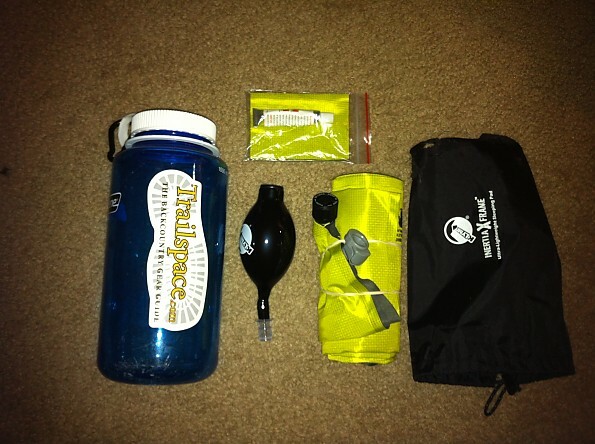 I've used this for backpacking in the mountains of Colorado on some pretty cold nights. I'm 5'9 and this worked perfectly. The model sleeping bag I have has outer straps for sleeping pads and I've used those for attaching this pad to the bag. I think for this reason I have never experienced any cold pockets when shifting around as others have noticed. I also use a down bag in the mountains here so the sleeping bag tends to have a lot of loft which helps this product be more effective at colder temps. It's relatively easy to setup and comes with a bulb used for pumping it up. It is quite light and stores in a small bag. Also comes with a patch kit which I have never used. The product appears very durable and well made. I tend to take very good care of my backpacking gear but this thing appears it could take some abuse and still work very well. This pad is that it can sometimes be tricky to completely deflate sometimes. Other times I seem to get it just right with no issues. Even so, it doesn't take up a lot of space in your pack so even not completely deflating is an issue. I tend to roll around at night when I sleep and my other complaint is that the design of the pad can allow one to slip through the holes and feel the hard ground underneath. If you lay on your back or stomach a lot, this pad is probably for you. The design keeps you off the ground pretty well. If you sleep on your sides, or roll around a lot, you may have issues at certain times in the night. Even though I occasionally run into those issues, I have gotten some good nights sleep with this pad. Very lightweight and small. Perfect for backpacking and remaining off the ground while comfortable. I purchased it online for about $50, which is a bit pricey, but still acceptable, given the pleasures of a good night's sleep in the bush. It reduces down to slightly smaller than a red solo cup. Or, put another way, slightly shorter than a soda can, but also slightly fatter. Weight is 298 g with the stuff sack, or 10.51 oz. The design is marketed towards helping your sleeping bag retain loft due to the cutouts in it (as well as weight reduction). It comes with the already mentioned repair kit and an inflation bulb (like the thing the doctor squeezes when taking your blood pressure). It takes about 8 breaths to fill, after which you can use the bulb to increase the air pressure. I am not sure you need to bring the bulb, as when I used it, it just over-inflated the mattress to the point of me sliding on top of it rather than sinking down into it. Leave the bulb at home and drop a few grams from the weights listed above. Overall, a great product so far (5 nights in the field). I'd buy it again. Nice change from the old Therm-a-Rest 1 inch pads and perfect for those ultralight guys who want the lightest. I have used this five nights and at first very impressed but after my last night, which was very cold and long. I wished for my full mattress that is 2.5 inches thick. Still think it would be great for those people concerned about fastpacking and weight. ...that happens to compete with 4 season pads weighing much more.